The comber team made there way to billy neill playing fields for a 10.45 k/o against a Downpatrick team who they where meeting for the 1st time . 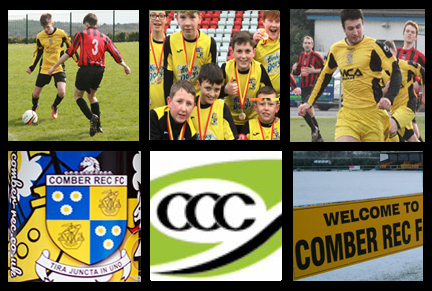 Another must win for the comber lads if they wanted to keep in with a chance of winning the league . Conditions for the game where very good and the referee got the game underway . The opening 10 mins was end to end with no one stamping there authority on the game. 13. Minutes in 1-0 to downpatrick terrible play from the comber lads ended with the downpatrick lads cutting the midfield and the comber defence open to fire home a shot . Same old problem no communication , no desire or commitment from the comber lads to take control of this match,17 minutes gone capt Matty. Gibson fires one home an unstoppable shot to make it 1-1 . 25 mins gone another mistake in not closing down the visitors and there big centre forward punishes the comber players to make it 2-1 . The comber management team are pulling there hair out at the lack of communication and poor play by the team and cant wait to the halftime whistle goes to regroup and try and sort this shambles out . 8 mins to halftime and the “ doc” Callum McKay bursts through to score the equaliser to make the halftime score 2-2 . Some strong words from the coaching team and the rec take to the field for the 2nd half with changes , Brandon the dancer with drawn for Cameron the kebab king Haslam replacing him at centre half ,Callum the doc moving to left back and benji the blonde bomber moving into left wing ,the ref gets the game under way with the REC lads on the attack determined to try and rescue the game ,disaster strikes 10 mins into the 2nd half and Downpatrick go 3-2 in front . Can the rec lads get back into this ,5 mins later and it’s 4-2 to Downpatrick again poor play by the Rec no communication ,no one closing the players a terrible display by the rec lads . Time is running out for the REC to get anything out of this 6 mins to go and sadayu ( jack) slots the ball home to make the score line 4-3 ,could the great escape be on the REC CONTINUE to press but it’s to no avail the ref blows up to bring the game to an end final score COMBER REC U17 3 v. DOWNPATRICK 4 . Back the drawing board things need to improve if all the lads hard work falls apart . MAN OF THE MATCH .CALLUM ‘ THE DOC ‘ MCKAY . Team : Tom lappin, Cameron Haslam, Alex Hamilton, Brandon Cromie, Pat Mack, Jonny Jackson, Matty Gibson ( capt), Luke Johnston, Callum McKay, Adam Martin, Sadayu jack.